Studio Line: Warner Bros. - It's Scrumdiddlyumptious! Twenty five years after this merry movie charmed audiences with a colorful mix of song, humor and life lessons, the Candy Man still wields magic, especially now in a vibrant new print with a new soundtrack in true stereo. From the classic Roald Dahl story comes a lip-smacking delight with jolly tunes, among them "The Candy Man" and "Pure Imagination". With a golden ticket young Charlie Bucket wins a tour of the factory of wily mogul Wonka and run by his Oompa-Loompa crew. There Charlie, his Grandpa Joe and others discover a kind heart is a finer possession than a sweet tooth. Don't let the tour leave without you! DVD: Widescreen 1.85:1/16x9, standard 1.33:1; audio English DD 5.1, French Dolby Surround, Spanish Digital Mono' subtitles English, French, Spanish; closed-captioned; double sided - single layered; 40 chapters; rated G; 100 min. ; $24.98; street date 9/30/97. Supplements: Theatrical Trailers; Production Notes. Talk about taking a ride on the way-back machine! Every once in a while I check out something that I remember (usually fondly) from my childhood, but few go quite so far back as 1971's Willy Wonka and the Chocolate Factory; I saw this when I was exceedingly young, but I still remember it pretty well. I genuinely loved this film as a child, and I also adored the book (as well as its sequel, Charlie and the Great Glass Elevator). I even chowed down the Wonka brand candy (loved those Scrumdiddlyumptious bars)! With this history as a background, my sentimentality had a lot to lose by watching Wonka; if it turned out to be a dud, there's yet another little piece of my past shot to bits! That's always the danger when you decide to see if something's as good as you remember. Most of the pleasure I derived from the second half of Wonka came from Gene Wilder's deft performance as old WW himself. Wonka's a shifty character; it's very difficult to decide from moment to moment if he's a decent fellow or if he's quite nasty. He's definitely somewhat sadistic; he doesn't look terribly upset when the nasty little children receive their comeuppance. In fact, he borders on being the John Doe (from Seven) of the candy bar set! To his credit, Wilder works to make sure we never quite get a handle on Wonka's true intentions. Even at the end, when what appear to be his true desires and thoughts emerge, I still was suspicious of him. Wilder manages to show us the positive and charming side of Wonka while always keeping that touch of semi-perversity and eccentricity fairly close to the surface. It's safe to say that Wilder's performance is largely the reason this film is still so well-regarded. Not the same can be said for Peter Ostrum's exceptionally bland performance as Charlie. Why is it for every Edward Furlong that casting directors find, we get ten Peter Ostrums or Jake Lloyds? Those kids give international talent searches a bad name. To be fair, Ostrum isn't as disruptively bad as Lloyd was in The Phantom Menace, but he's nothing more than a cipher and as such, never really compels us to care about the character. Contrast his performance with that of Paul Terry in a more recent adaptation of a Roald Dahl novel, 1996's James and the Giant Peach. Terry offers much more compelling work, even though he receives only a fraction of the screen time due to Ostrum (since most of James' scenes depicted him as an animated character). Emotionally, Ostrum possessed two modes: happy and sad. Unfortunately, his "happy" looks like "stunned" whereas his "sad" comes across as "constipated." Ostrum's lack of range doesn't really matter during the second half of the film - Charlie doesn't have a whole lot to do once they're in the factory - but it does hurt the first half, since I never actually cared if Charlie found the stupid winning ticket or not. James I cared about - he was a sympathetic and appealing character - but Charlie? Eat your cabbage soup and shut up, you pasty-faced little troll! Jack Albertson fares a little better as Charlie's Grandpa Joe, but his role suffers from the fact that it really doesn't need to exist. Early on we see that Charlie has a strong connection with Joe, but I never saw any real reason for this other than Joe seems to believe in Charlie just a little more than his other relatives (who all seem quite nice, nonetheless). While the problem with Charlie stems from the actor's lack of personality, Joe's issues mainly concern the general uselessness of the character himself. Joe's just kind of there, without much purpose. Still, Albertson was a fine actor, and I enjoyed seeing him. The remainder of the supporting comes across more strongly. Julie Dawn Cole offers what remains the definitive portrait of a true brat as that nasty piece of work called Veruca Salt. Obviously the filmmakers recognized the power of Salt since she is the only one of the bad kids to get her own song. Also good is Denise Nickerson as crass little Violet Beauregard; she sometimes doesn't seem quite nasty enough - wanna make my Violet more violent! - but she still shines. The two boys in the group - Michael Bollner as tubby Augustus Gloop and Paris Themmen as video-obsessed Mike Teevee - are perfectly adequate, but they don't make as strong an impression as the girls; Bollner receives very little screen time, and Themmen really needed to be more loud and obnoxious. (For my money, Gloop has the best introduction of the bad kids; when an interviewer asks him how he feels upon finding the first golden ticket, he barely pauses from his meal to shout, "Hungry!"). I'm not a fan of musicals, and that distaste carries over to Wonka. Really, I don't see the need for the songs; they mostly seemed to get in the way. Too often it just seemed like someone decided "Time for a number!" so the characters drop everything to sing. Some songs are better integrated than others - Salt's tune works okay - but I can't say that I understand why they bothered to make this a musical; it would have worked even better without all the showtunes. I may receive flack for this, but the songs from the Oompa Loompas were probably my least favorite aspect of the film. Okay, they're catchy tunes which will stick with you for pretty much forever, but I genuinely hated the scenes in which their songs were performed. To have the Oomps warble annoying little ditties that completely spell out the various morals seemed ridiculously redundant. I mean, it's not like Mike Teevee or Veruca Salt were subtle character studies; we picked up that they paid for their overindulgences without having some little people sing it to us. It seemed inconsistent that we had a character as evasive as Wonka but we kept getting hammered with these "Afternoon Special" morals. I have no problem with the various messages sent by the film; I just didn't care for the overbearing method in which they were frequently delivered. Then again, the Oomps might be just fine and I'm simply cheesed off because now I'm going to have that silly melody running through my head for the next few days - who knows? Despite these faults and a little questionable acting, Wonka remains a winner of a movie. It's aged quite well and it shows no signs of losing appeal to both kids and adults. 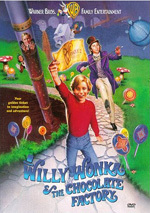 Willy Wonka and the Chocolate Factory appears in both its original theatrical aspect ratio of 1.85:1 and in a fullscreen transfer on this double-sided, single-layered DVD; the widescreen image has been enhanced for 16X9 televisions. Only the letterboxed side was rated for this review. The DVD release of Willy Wonka offers a decidedly mixed bag. In regard to picture quality, Wonka is a mess. While the colors look terrific - they are quite bold and vibrant, which is important in a film that uses hues so broadly - the image itself is usually very soft, hazy, and grainy. At times it looks decent, but only infrequently. Worst scene? Veruca's song. It looks horrible, and appears truly akin to a very old, very worn out VHS tape! Wonka is usually fairly watchable, but the picture is a genuine disappointment. I found the Dolby Digital 5.1 mix of Wonka to sound surprisingly good considering it was remastered from mono. When channels other than the center speaker are used, they tend to be reserved for music; the score sounds a bit trebly but generally pretty solid. Occasionally effects pop up from the right and left front channels, and maybe once we heard something from the rears, but the audio tended to keep almost everything other than the music stuck in the center. Dialogue and effects didn't sound bad, though speech did tend to be too harsh. Nonetheless, it remained consistently intelligible, and the soundtrack offered a much more listenable and involving experience than I expected. The supplemental features of Wonka resemble the man himself: they're not what they seem. At first glance, the DVD seems to be packed; we see many screens worth of information. Unfortunately, they all add up to little more than you would get in the usual "production notes" section; there are lots of different screens worth of material but the total doesn't give you much more than you'd find in the typical DVD booklet. It's nice to have, and it's moderately interesting, but it's nothing special. Wonka also contains two trailers, one from the original release and one from the reissue. The former is especially noteworthy as an example of a horrendous trailer. That sucker gives away far too much of the story, including the fates of each and every one of the children - including Charlie! It shows exactly how each kid gets their just desserts. What was the deal with that?! Willy Wonka and the Chocolate Factory clearly offers a very entertaining film but the DVD seems marred by a genuinely poor picture; decent sound and a few supplements don't balance out that problem. In the end, I pretty much need to steer everyone away from Wonka. Pass on it now and hope that they'll see fit to remaster it at some point, unless you can find it for a ridiculously low price; I wouldn't want to pay more than $10 for it.